A new feature added to iCloud's Find My iPhone in iOS 8 passes along an iPhone or iPad's geolocation data to Apple just before its battery completely dies, boosting the chances of finding the device. Appropriately called "Send Last Location," the new capability will automatically send an iOS device's last known location to Apple when its battery drains to a predetermined point, giving owners one last chance to find it before it disappears from the grid. 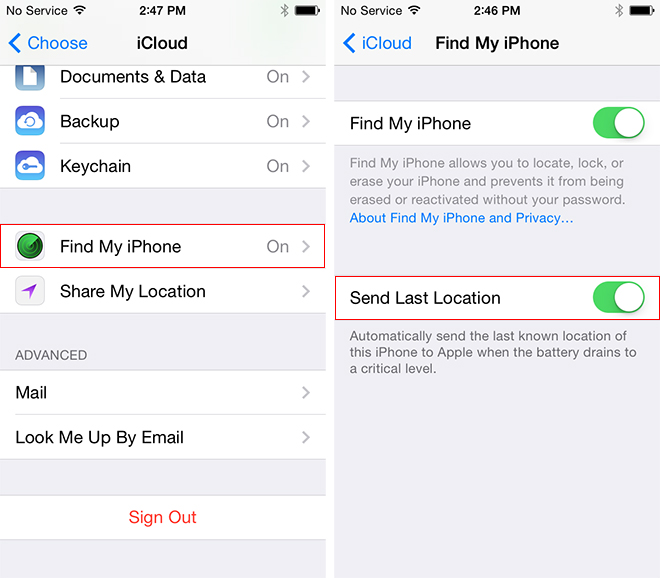 At this stage, the threshold at which location data is sent and stored is unknown, but the current iCloud standard is to log a device's last known location for 24 hours. The extra time could be vital in finding a stolen iPhone or iPad. Existing protection assets already allow users to track, send messages to, lock and wipe a lost or stolen device via iCloud. These features can be thwarted to some extent by turning the iPhone off and isolating it from a data connection, but a thief must break a user's passcode to gain functional access to the device. It is unknown how the "Send Last Location" system will work when iOS 8 is released this fall, though it can be speculated that Apple will store a device's last known whereabouts and possibly make that information available to the user through the Find My iPhone tool. While the feature's toggle switch can be activated in the iOS 8 beta, the corresponding service may not yet be up and running.